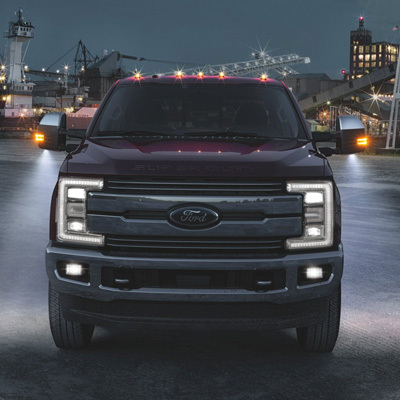 With high-strength military-grade aluminum-alloy body, and high strength steel frame the 2019 Super Duty is now stronger and lighter than ever before. This means the best towing power, best payload, and best ride and handling of any Super Duty Ever. It’s not just about how much you can tow. It’s how confidently you can tow it. There are also up to seven available cameras that monitor the world 360 degrees around you. There is even a camera available for the back of your trailer. And they all feed into one screen where you can keep your eye on whatever view you want. If there were ever a truck that was over-engineered, it would be the 2019 Ford F-350 Super Duty. Every F-350 heavy-duty truck you see on our Ford new dealership lot in Humboldt, Saskatchewan is the result of more than 19 million cumulative hours of torture testing. From scorching Death Valley heat to bone-chilling cold weather testing in Northern Manitoba, the 2019 Ford F-350 Super Duty has seen the toughest possible conditions you could throw at it. If you’re looking to tow trailers, haul hay bales, or pull lesser trucks out of the mud, choose the 2019 Ford F-350 Super Duty. We have a huge selection of F-350s in all trim levels including XLT, Lariat, King Ranch, and Platinum. Care to see what we have in stock before driving over? 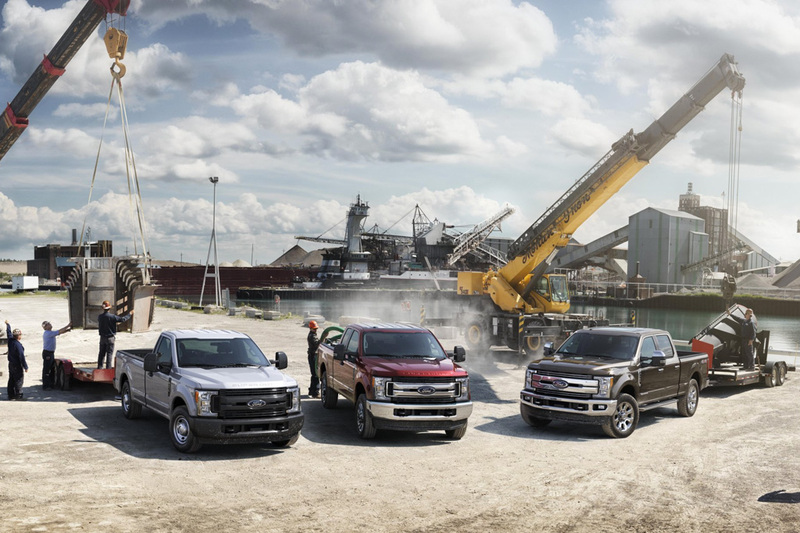 Check out the Discovery Ford new F-350 inventory here. You can filter the results by year, colour, price, and body style so that you can find the exact truck you want. Both of these powerhouses are available with 4×4 and 4×2 drivetrain configurations. And those ponies are connected to the earth through a TorqShift 6-speed SelectShift automatic transmission. If only the bed were large enough  then it would be possible to haul a full-sized SUV in it. That’s how strong the 2019 Ford F-350 Super Duty’s combination of engine and frame is. In the highest specification, the F-350 can carry a whopping 3,461 kg payload capacity. As for towing, the 2019 Ford F-350 Super Duty makes a fully laden 5th wheel trailer feel like a Radio Flyer with a monstrous 14,742 kg gooseneck towing capacity. Moving all that mass sounds daunting, but not in the 2019 Ford F-350 Super Duty. All Power Stroke optioned F-350s feature a Tow/Haul Mode with seamless engine braking and selective gearing that improves control and component wear when descending steep hills. Why head back to the office when the 2019 Ford F-350 Super Duty is just as productive? SYNC 3 with MyFord Touch allows you to stay in contact with your team through hands-free texting and calling. Plus, this all-in-one infotainment system can stream all your music from your phone, and can recite route directions should you be heading to an unfamiliar worksite or get-together. The 2019 Ford F-350 Super Duty isn’t just all business, though. Premium interior materials, large supportive seats, and copious storage bins mean that transporting the whole crew or family will be a comfortable and convenient affair. Even if your 2019 Ford F-350 Super Duty is the company workhorse, it doesn’t mean that you can’t dress it up a touch! Should you wish to get a chrome exhaust tip, window deflectors, seat covers, bed-liner, tonneau cover, chrome wheels, or step up bars for your F-350, check out the parts department at Discovery Ford in Humboldt, SK. Our accessories and service experts can help locate the genuine Ford part you’re looking for, get it brought into our dealership, and have it installed on your truck with minimal downtime. Want to book a repair or installation appointment? Use our online form – it’s quick and easy.